Dishinikawshon Laura Forsythe. Red River Metis nki nitáwikin. My name is Laura Forsythe. I am Metis from the Red River. As the Indigenous Program researcher from Career Services and the Treasurer of the First Nations Student Association I invite each of you to come and witness the journey stories of five amazing Indigenous storytellers at the 4th annual Indigenous People Career stories. They come from across Canada to share their journeys expressing the adversity and perseverance each storyteller faced through their lives. It will be through this two-hour event that we will be able to engage with the storytellers as well as each other. A traditional Indigenous dinner will be provided giving us all a chance to share a meal while speaking with the storytellers after the formal panel portion has been completed. 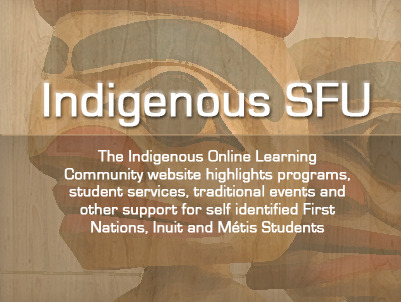 This will allow all of us to meet and engage in our SFU Indigenous community as well as those closely connected to SFU. WHERE: SFU Burnaby Mountain Campus - Halpern Centre. Listen to our panel from various walks of life introduce themselves and discuss their backgrounds, their education, the obstacles they have overcome, and their career path. These Indigenous representatives are from a variety of organizations, industries and Nations here to tell their stories and answer your questions. The panelists have been chosen from nominations provided by SFU students, alumni and staff. Captain Michael F. Harris is from the Gitxsan Nation, House of Wii Gaak, Wolf Clan from northern BC. His involvement in the marine industry has spanned 42 years, as a deckhand and as a Captain. He has toured extensively throughout BC, sharing marine employment opportunities. Michael's been a board member of the Elders Medicine Wheel Society, Urban Gitxsan Society, Skemcis Medicine Lodge Society, Lower Fraser Valley Aboriginal Society, Chilliwack Big Brothers, and Big Brothers of BC, The Vancouver Aboriginal Friendship Centre, Elders Program, the Kinsmen Club, and the Langley Hard of Hearing Association. He is also a trainer and former leader for Scouts Canada; a Native spiritual and cultural teacher, and the founding President of the Chilliwack District Deaf / Hearing Association. Captain Harris exemplifies community engagement and serves as an inspiration. Michelle Martinson is a Metis woman from Northern Manitoba. She is a recent graduate of the UBC Executive Masters of Business Administration program at the Sauder School of Business. Having started her schooling as a mature student, she completed a Bachelor of Science in Nursing in 2007 while raising her two children. Martinson is the current chairperson of the British Columbia Nurses Union Aboriginal Leadership Circle and she also works as a nurse clinician at the Seniors Outreach Team on Vancouver Island. Martinson is a member of the Association of Registered Nurses of BC, Aboriginal specialty group development, the Aboriginal Nurses Association of Canada National Forum Committee, and a partner for the Canadian Nurses Association in Aboriginal Nursing Policy development. In 2014, she will run for President of the British Columbia Nurses Union. Steve Sxwithul’txw from the Penelakut Tribe located near Chemainus, BC is a graduate of the BCIT Broadcast Journalism Advanced Diploma program. Following his passion for broadcasting he has produced, reported, and researched for APTN, CTV and CBC. This includes a season as story producer for the current CTV Aboriginal show “First Story” and host for “Down2Earth”. An independent producer, Steve had his own show "Warrior Games" picked up by APTN debuting in 2014 which was produced and hosted by Sxwithul’txw. He is also the Coordinator for Island Health's (formerly VIHA) Aboriginal Employment Program which facilitates health career workshops, outreach and develops long-term planning initiatives. The focus of the program is on enhancing relationships and capacity with First Nations on Vancouver Island with a desire to recruit and retain Aboriginal peoples in health. Jodie-Lynn Waddilove is an Anishnabe (Ojibway) and Lenni Lenape (Delaware) lawyer from the Munsee-Delaware Nation in southern Ontario. Her traditional name is “Giim-Mah-Myengun-Kwe” which means Head Chief Wolf Woman. She is a member of the wolf clan. In 1999, Jodie-Lynn received her Bachelor of Arts degree from the University of Western Ontario. In 2000, Jodie-Lynn then received her Masters of Arts degree in International Criminology and Law from the University of Sheffield in England. While studying in England, Jodie-Lynn was admitted to the Lincoln’s Inn. In 2004, Jodie-Lynn served as Assistant Commission Counsel for the Ipperwash Inquiry. In 2007, Jodie-Lynn joined the Ministry of the Attorney General (Ontario) in the Crown Law Office – Civil in Toronto. She is currently on secondment with the Ministry of Community Safety and Correctional Services, doing Police Service Act prosecutions for the Ontario Provincial Police at their headquarters in Orillia. She travels and speaks frequently on this topic. Cease has been involved in food security and food sovereignty for several years. She worked with Vancouver Native Health Society in their food security programs, both building the resources from the ground up as well as helping communities learn how to do this themselves. Cease began with delivering programs throughout Vancouver such as AGFB: Aboriginal Good Food Box; a monthly produce box with local, seasonal and organic produce and focusing on Aboriginal food systems as well as traditional knowledge in recipes and urban community feasting. She has helped to create community gardens throughout Vancouver, and North Vancouver, as well as supporting local Indigenous food systems and resources. Cease is currently working with the youth and elders from the Skwxwu7mesh Nation to restore the Capilano River Estuary, in addition to five years of service working on projects such as Community Gardening with Indigenous food systems as their focus, and reviving ancient food systems in her territories. Cease has been mentoring youth in new media and ethno-botany since the early 90’s. Through interactive gaming Cease hopes to help bring people back to the land and learn how to explore local green spaces while learning important skills and abilities, and most importantly, a deeper respect for Mother Earth.